In Rock Your Wings, I described our first flight to Oshkosh and my unexpected emotional reaction when the air traffic controller instructed us to rock our wings. After we rocked, the controller said “Nice rock” and gave us the rest of our instructions, advising us that runway 27 was in use, that we should follow the railroad tracks and join the right downwind for runway 27. He told us which of the Oshkosh tower frequencies we should switch over to. A few minutes later, we had the airport in sight! Joining a right downwind for runway 27 meant that we were to fly slightly to the north of the runway, parallel to it, in the direction opposite to the way we would land. 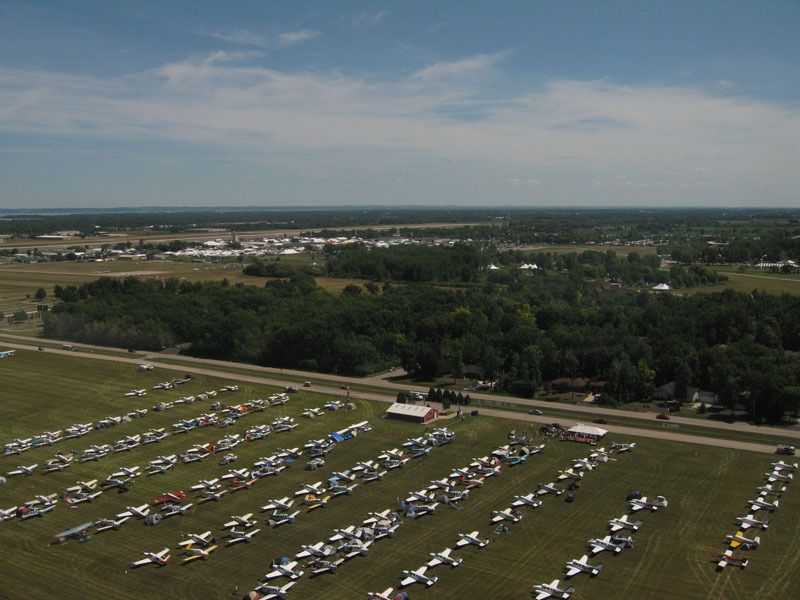 This gave us a chance to get a great look at the action – the airplanes landing on the runway and taxiing on the grass towards the rows upon rows of airplanes with tents beside them! After we passed the ‘landing’ end of the runway, we were instructed to make our base turn (towards the runway). Jeff did so and began to configure the airplane for landing; extending the flaps, slowing down and descending. Just as Jeff was making our right turn onto the final leg, he noticed a faster airplane coming from our left, at a lower altitude. He was travelling in the same direction that we were just turning to – towards the runway for landing. We heard the controller clear someone to land on the green dot and then we were cleared to land on the orange dot. As soon as we were lined up with the runway, Jeff cursed and said “Do you see him?” See who?! I had not seen the airplane that Jeff had glimpsed as he made the turn towards final. The other airplane was conducting an IFR (instrument flight rules) arrival, which means that they were coming straight in to final approach from the east. He was lower than us, on a 3 degree glide slope, compared to our 6 degrees. Now he was hidden from our view below our airplane…and we were descending! There was never any danger, as the controller had us both in sight and he had cleared both of us to land. However, with our lack of experience in this high-traffic type of environment, we were not comfortable. Jeff immediately arrested our descent by applying some power at the same time as extending the rest of the flaps. The extra flap angle had the desired effect of reducing our speed over the ground and increasing our forward visibility and a moment later, we saw the other airplane shoot out from beneath us and proceed towards his landing target – the green dot – phew! Jeff resumed his normal landing approach and touched down smoothly on the orange dot. We were then instructed to immediately exit onto the grass and follow the linemen to our parking spot. Taxiing on grass is not as easy as taxiing on pavement and it was a long way to taxi, so I helped Jeff pull back on the control yoke to lighten the load on the nose wheel. We followed the linemen (and women) all the way to the very last row of the campground, as the campground was getting full. Once we arrived at our parking spot, Jeff shut down the engine and we opened the doors. 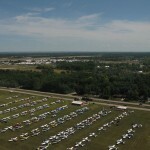 We had made it to AirVenture! I climbed out and immediately started jumping up and down, literally squealing with excitement. “Hi, welcome to Oshkosh!” I heard someone say. I turned and saw the camper receptionist grinning at me. “Is this your first time?” he guessed. I wonder how he could tell? I couldn’t even speak. I nodded excitedly and he laughed with delight. You Can’t Just Pull Over…. How Small and How Old?